For thousands of Bangladeshi farmers in flood-prone areas, growing rice is a risk they have to take each season. Jitendra Nath Sarkar, a 60-year-old farmer in Kurigram District of Rangpur in the northern part of Bangladesh, is all too familiar with the nourishing nature of the rain and rivers—and the frighteningly destructive force of their raging floodwaters. Fortunately, some farmers, such as Mr. Sarkar, have found a way to overcome this debilitating reality. Beginning in 2007, the Bill & Melinda Gates Foundation (BMGF) has been working with the International Rice Research Institute (IRRI) and the Africa Rice Center to ease the effect of floods on the lives of farmers. IRRI, through the Stress-Tolerant Rice for Africa and South Asia (STRASA) project, works closely with the national government in developing and promoting the use of rice varieties that can withstand environmental pressures, such as flooding, faced by millions of poor farmers. Developed by IRRI in conjunction with its national partners such as the Bangladesh Rice Research Institute (BRRI), these varieties include BRRI dhan51, a variety that can survive under floodwater for up to two weeks while most rice plants die in a matter of days. During the 2010 aman season, Mr. Sarkar received some BRRI dhan51 seedlings from BRRI in Rangpur. He transplanted these on 250 square meters of his land. He also received training on quality seed production and seed preservation from STRASA. Soon after, floodwater inundated his entire field for at least two weeks. He thought that, like the previous years, his crops were damaged beyond hope. But, Mr. Sarkar saw his BRRI dhan51 emerging from the rotten remains of his other crops. Within a few days, the flood-tolerant rice plants were growing as if nothing had happened. Farmers often perceive new technology as a risk. With no previous experience with a novel crop management method or a rice variety, farmers tend to be cautious. But, Mr. Sarkar’s venture paid off. From his BRRI dhan51, he harvested a bumper crop of more than 7 tons of rice and sold it for nearly USD 3,700. Since then, his commitment to these new rice varieties has grown along with his family’s financial stability. In 2012, he produced almost 5 tons of rice and made USD 2,200 in profits. 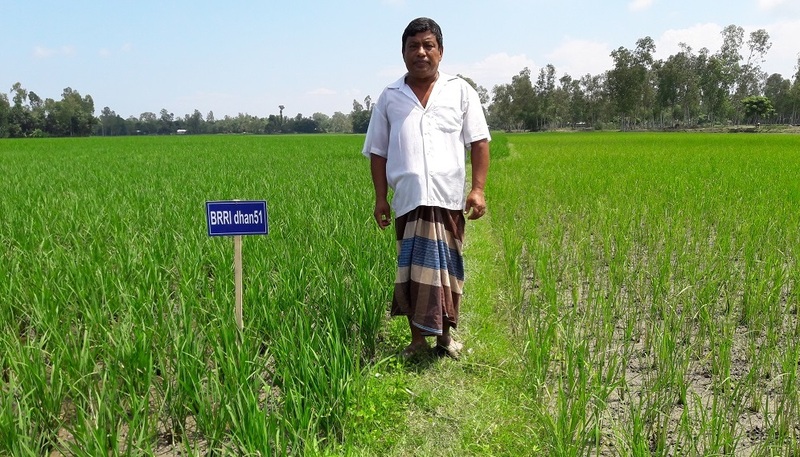 In 2016, Mr. Sarkar received nearly USD 2,000 from the 3.5 tons of rice he harvested. A second crop of BRRI dhan51 produced nearly 4 tons of rice and brought in nearly USD 2,100. He also noted that the variety needs less urea fertilizer. He calls BRRI dhan51 a miracle variety and believes that it changed his life. “I have more food for my family and have extra rice to sell in the market to bring a little bit more money into the household,” Mr. Sarkar said. Today, his family is doing much better and he has saved enough money for his sons’ education.